Far from casting a gloomy shadow over Christmastime, rationing saw many people banding together to spread the festive spirit. With new gifts few and far between, handmade presents were the call of the day, while reduced baking supplies saw great innovation in the kitchen. Rumours were spreading that rationing would start on Christmas Day, 1939. By then the turkey would have already been stuffed and the cake trays buttered. Larders and pantries would be well stocked with goods for the festive season, so there'd be plenty to go round for a little while, at least. However it wasn't until January 8th the next year that it was enforced. In the following years rations of tea and sugar were often increased for Christmas, and extra supplies of onions, grapefruit and lemons were available as a festive treat. Suddenly there were enough supplies for meat dumplings, peppermint slab toffee and milk chocolate caramels, treats that many hadn't seen for months. Recipes started appearing in newspapers and magazines, suggesting innovative ways to use up the extra rations and avoid waste. Others included instructions for "quite eggless" Christmas pudding. 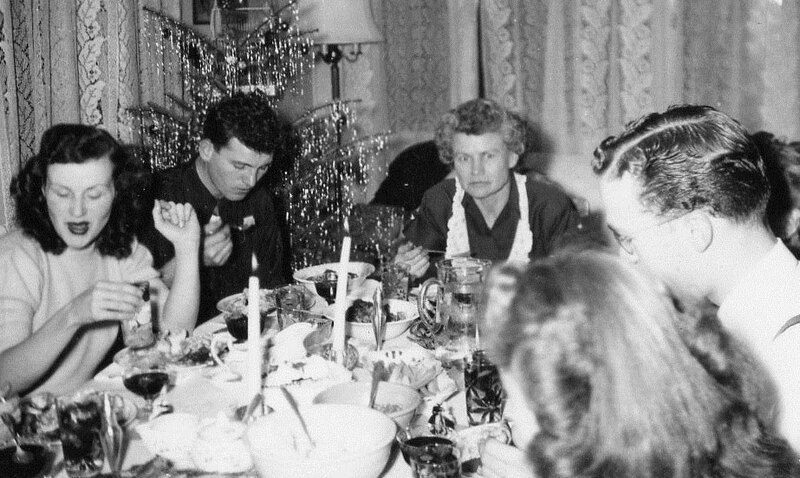 Some wily families saved up stamps in advance to supplement the extra rations, meaning that many had enough for a lavish feast by the time Christmas day came round. Despite the restrictions, many homes still managed a roast duck or goose followed by Christmas cake or plum pudding. Any leftovers were quickly snapped up into a bottle, pickled or otherwise preserved to eat later. Most houses were still decorated for the festive season. Christmas trees, holly and mistletoe were surprisingly easy to come by, though often more expensive than previous years. Those who couldn't afford them would decorate tree branches with paint and cellophane bows. Many, of course, still had decorations from previous years. Gifts were another matter. Coupons had to be used carefully to purchase clothes or other new goods. New toys were in short supply, with many factories being requisitioned by the government to support the war effort. However this obstacle was quickly overcome with toy swaps organised by local groups and neighbours. Others would fashion their own toys out of wood or paper. There was no shortage of innovation when it came to creating handmade gifts. In 1949, Homelands Grammar School in Derby made hundreds of toys for children in institutions or hospitals. The students stitched animals out of felt, including Scottie dogs and a kangaroo with a detachable joey in its pouch. One girl made a tea cosy shaped like an elephant out of an old coat. 12 year old Ruth, who was more interested in woodcraft than needlework, fashioned a rocking cradle. 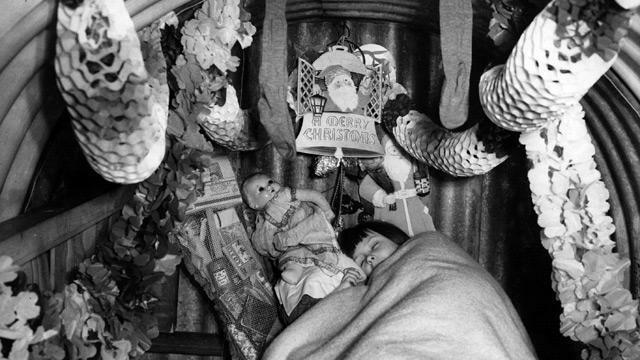 However not everyone was so quick to channel the wartime Christmas spirit. Many wrote letters to the newspapers complaining as rationing was continued after the threat of war had passed. But one woman gladly put the situation into perspective, writing in to the Sunderland Daily Echo in 1950: "Be fair. The present Government has had a topsy-turvy country to straighten out and any one with any sense at all ought to know that it will take years to arrive at pre-war standards. Indeed I think that there are far more serious things to think about at the present time than our rations, the state of the world situation, I mean." She concluded "Cheer up, ladies, and be thankful that, at least, you are alive to enjoy your pittance as you put it."